The topography of Malaysia is quite unique for the country is made up of two distinct halves, peninsular Malaysia, which lies to the west, south of Thailand, north of Singapore and east of the Indonesian island of Sumatra and East Malaysia, located on the island of Borneo bordering Brunei and Indonesia. These two distinct halves of Malaysia are separated by the South China Sea. However the South China Sea is not the only body of water that borders the 4,675 kilometer (2,905 mile) long Malaysian coastline. Other prominent bodies located within close proximity of Malaysian shores, include the Straits of Malacca, the Andaman Sea, the Straits of Johor, the Sulu Sea and the Celebes Sea. It is no wonder then that the many fruits of the sea feature prominently in native Malaysian cuisine. Shrimp, prawns, crabs, squid, sea cucumbers, cuttlefish, clams, cockles, snails, octopus are consumed by most Malaysians. In fact, Malaysian Muslims consider sea food to be halal so it figures prominently in their everyday diet. 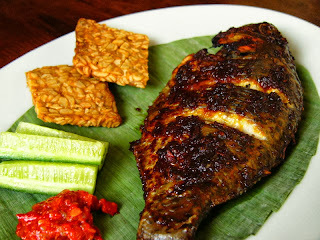 Moreover seafood is available in abundance in almost every part of Malaysia. So if you have a passion for seafood you are bound to find yourself in seafood heaven whilst visiting Malaysia. Listed below are some popular Malaysian seafood delicacies which must be sampled on any trip to Malaysia, especially if you enjoy consuming crustaceans and more. An encounter with a stingray in the waters of an ocean can be fatal, but in Malaysia, grilled stingray is a much loved sea food delicacy. Served at restaurants and street-side stalls around the country, a dish of grilled stingray features the fish slathered in a spice mixture, wrapped in a banana leaf and grilled. The process of wrapping the fish in a banana leaf ensures that fish retains its juices and absorbs the flavors of the marinade. The term Ikan Bakar actually translates as ‘burned fish’ but that should not deter you from sampling this mouth-watering dish which features red snapper anointed with a sambal (spicy mixture), wrapped in a banana leaf and grilled. Both these much loved Malaysian dishes can feature much seafood depending on where they are sampled. 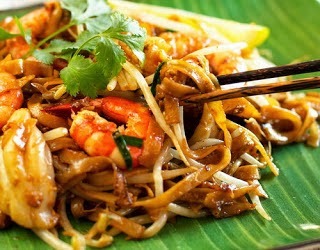 For instance, in Penang the traditional egg noodle dish, Char Kuay teow features shrimp paste(belacan) as a vital ingredient along with other seafood like cockles and prawns, while an Asam Laksa, Penang’s national dish consists of a spicy, sour broth made with tamarind and mackerel flakes. Asam Pedas is a fish-based curry dish associated with southern Malaysian states like Melaka and Johor. 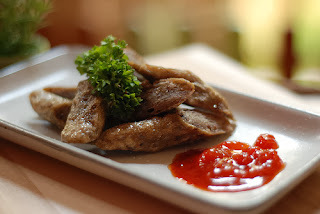 This dish is usually made with fish like Spanish macakrel, stingray or catfish. Other ingredients of Asam Pedas usually include dried chilies, shallots, belacan(shrimp paste), torch ginger flower, Vietnamese mint and tamarind juice. These various ingredients are ground together and then sautéed in a pot after which the fish is added to dish. A dish of Asam Pedas is finally finished with a swig of tamarind juice. Sambal Udang, is a yet another popular fish based preparation associated with the Baba Nonya (Peranakan) people of Melaka. Sambal Udang features whole prawns in a gravy made with sambal(chili paste), belacan(shrimp paste) and tamarind juice. Otak-Otak is a fish cake fashioned out of fish paste made with mackerel and combined with various other ingredients like chili peppers, garlic, shallots, turmeric, lemon grass and coconut milk. This cake is then wrapped in a softened banana leaf and grilled or steamed. Otak-Otak is usually consumed with rice or bread. The town of Muar in the Southern Malaysian state of Johor is famous for its many different varieties of Otak-Otak. In Muar Otak Otak is also made with prawns or even cuttlefish. A variation of Otak-Otak served in the eastern Malaysian state of Kelantan is known as Satar and it features a larger portion of fish and less spice paste. In Melaka, otak-otak is wrapped in pandan leaves rather than banana leaves. Keropok Lekor or fish fritters constitute a popular afternoon snack in Malaysia. These fritters are made out of fish paste; sago flour and salt are best enjoyed hot off the wok. Kari Kepala Ikan or fish head curry is a cult favorite in Malaysia and there are numerous restaurants that exclusively serve this spicy delicacy. Fans of dish say that the eyes and the cheeks are the best parts of the fish and they are best enjoyed in this type of curry. Red snapper is the fish which is generally used to make fish-head curry. Fish head is believed to have Indian roots for the fish is semi-stewed in a spicy, Kerala-style curry which also features vegetables like okra and aubergines. Malaysia’s famed fish-head curry is best enjoyed with steamed rice or bread.